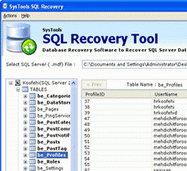 SQL MDF Recovery Software For Quick SQL Recovery! MDF file Extension: MDF file is a database file of SQL Server which is crated inside the system folder of the SQL Server Database folder. Master database file is the file that contains all the objects and data from the MDF file. MDF file is a bundle of the structure information and the data. Whenever the MDF file gets crashed then you can not access the data from the MDF file. When your MDF file has lost the access from your application that means there is some problem at database Server end. If we are using the SQL Server for data store that mean the problem may be in query or in the database file, which is MDF file. Our Company provides an ultimate data recovery program for your MDF file recovery. This MDF recovery tool has some awesome functionality and robust repairing technique. You can use the free Demo version to view complete process of database recovery in this SQL MDF recovery software. This tool can repair your MDF file for free and show you’re all the containing objects and data in tables after a quick repair but can not save with Demo version. Download & Buy The SQL Server Recovery Tool! Complete view of tables, Views, Stored Procedure, Rules, Triggers and functions. Open tables to view data, keys applied and indexes in application itself. Complete data types and schema recovery. Support SQL Server 2008, 2005 and 2000. Choose the database objects to recover after repair. Export directly to your server from the application. Export the database schema with or without data. Very easy to use and powerful to repair unlimited size database file.